Recently, my iPhone (5s, 16GB) began complaining that it was out of storage. So I went to Settings > General > Usage and found that Photos was taking up 1.8 GB, specifically the “Synced from Computer” category. So I go to Photos, and find that I have 2000+ photos. So I try to select and delete them – except I can’t. The trash can icon is grayed out. A little more research advises me to connect my iPhone to my PC, click on the iPhone, and then go to Photos and delete them from there. Except – there aren’t any photos there. I’ve used several different PCs and Macs over the past year and a half, and the iTunes library they were synced from is probably long gone. So how do I nuke them? iPhone users may have two kinds of photos in their iPhone, one are photos shot with iPhone camera, and the other are photos synced from computer. These two kinds of photos can both be viewed in the Photos app, but they are saved in two different locations. The photos shot with iPhone camera are saved in Camera Roll, and the photos synced from computer are saved in the folder that has the same name as you select from computer. If people want to know how to delete photos from iPhone 4s/5/5s/6/6s/SE, they will have different options for these two kinds of photos. The following post will introduce the methods which you can take advantage of to remove photos from iPhone. 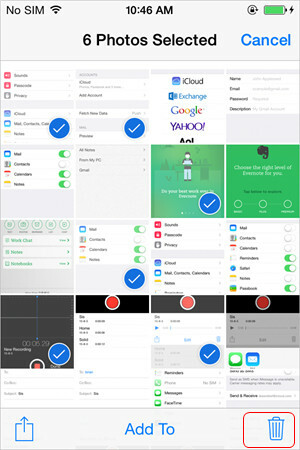 The photos saved in iPhone Camera Roll can be deleted directly with your iPhone. You only need to tap the photo you want to delete, and then tap the Trash icon at the right bottom. Then you will the photo to Recent Deleted folder on your iPhone, and if you want to delete the photo permanently, you should go to the Recent Deleted folder, and deleted the photo once again. If you want to remove multiple photos from iPhone Camera Roll, you should go to your Camera Roll folder, and tap Edit at the upper right corner, then select the photos you want to delete. After that, tap the Trash icon at the right bottom to move these photos to the Recent Deleted folder. iPhone users may often come up with the problem of switching to another computer or updating hardware for computer, and then find that the photos in their iPhone can’t be deleted though they are still available in their iPhone and take so much storage space. When meeting this situation, the iPhone users always feel annoyed. In fact, you can authorize the computer and connect iPhone to get rid of the photos you don’t need. If you don’t mind plugging iPhone in computer, you can remove Camera Roll photos from iPhone with your computer. After connecting iPhone to computer with USB cable, your computer will recognize your iPhone as a portable device and allow you to view its Camera Roll folder. Now you can select the photos and hit Delete key, or right-click the selected photos and click Delete. 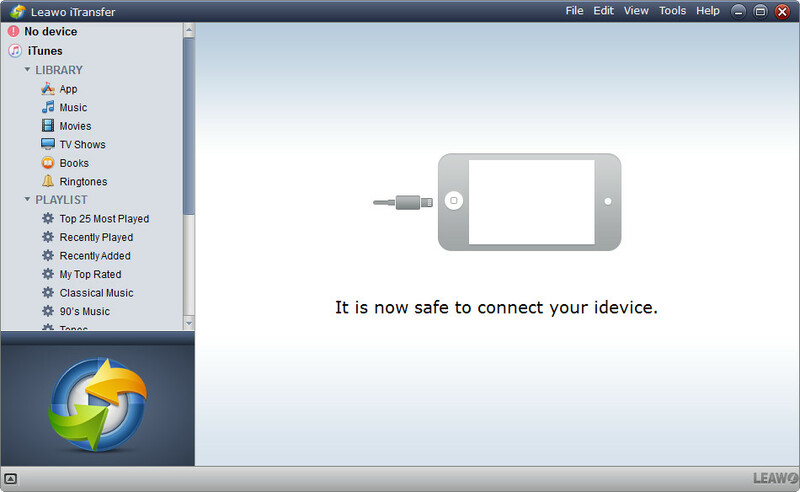 Plug iPhone into computer via USB cable, and authorize the computer. iTunes will recognize your computer and display the iPhone icon at the upper right corner. Click the iPhone icon and choose “Photos” in the summary panel. Check “Sync Photos from” and then choose “from folder”. Select the folder you stored your photos. Then iTunes will sync the photos from the folder to your computer. If the folder is empty, iTunes will also erase the photos in your iPhone and sync the empty folder to your iPhone. 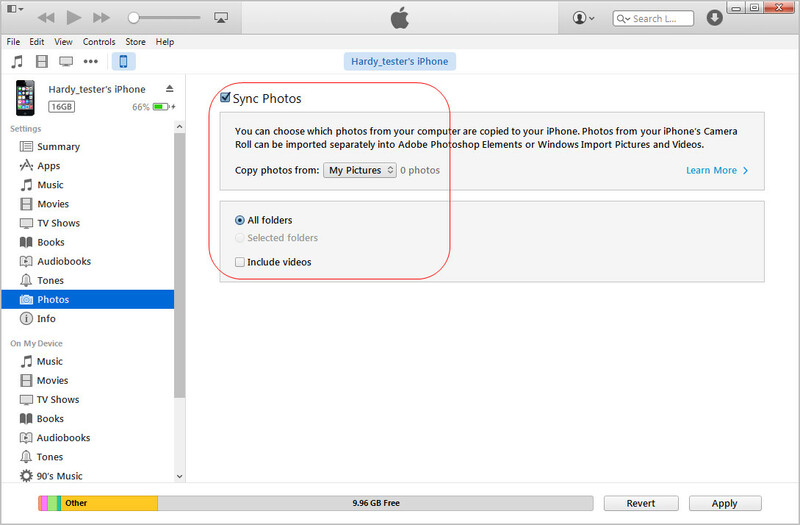 Re-syncing iPhone with iTunes will help you to remove synced photos from iPhone. You need to delete the photos you don’t need in the folder which you sync with iPhone, and then sync it with iPhone through iTunes again. With iTunes, you are able to delete iPhone photos synced from computer. But the trick will sweep out all the original photos in your iPhone library. If you want to delete photos from iPhone separately without deleting the ones you still need, you can use the third-party iPhone transfer software to finish the task. As you may know, the photos synced from computer can’t be deleted directly on iPhone. If people want to remove these photos from iPhone, they will need to re-sync iPhone with iTunes, or use the third-party iPhone transfer software to finish the task. If you want to delete photos from iPhone without iTunes, you can take advantage of Leawo iTransfer, which is regarded as the best iPhone transfer software. 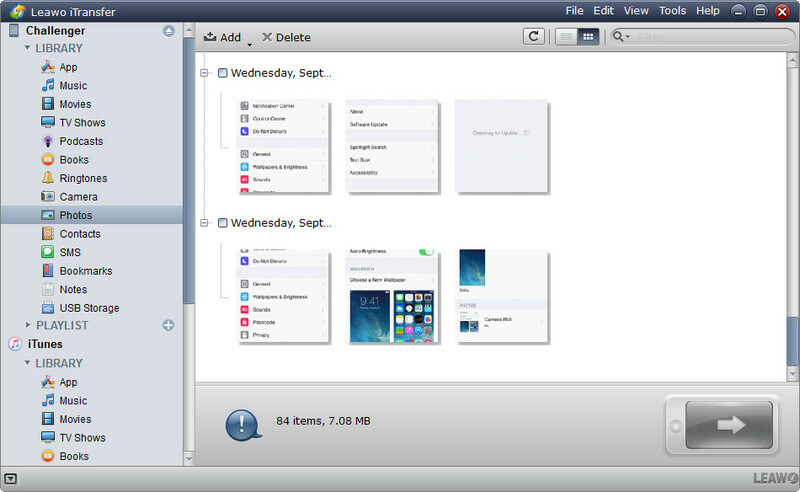 This software is used for transferring files among iOS devices, iTunes and computers, and it helps users manage their iPhone files. The following guidance will show you how to delete photos from iPhone, and you can free download the software to have a try. Step 2. Click the name of iPhone and choose Photos in the left sidebar. The photos will display in the right part. Step 3. Hold Ctrl/Shift key to select photos, and click the Delete button at the top middle. 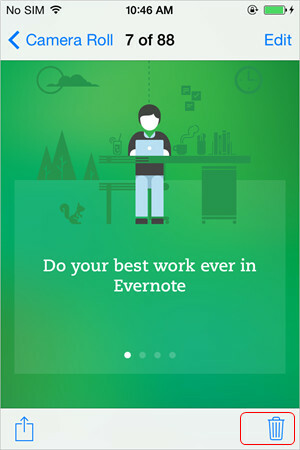 Then click Yes in the pop-up dialog. 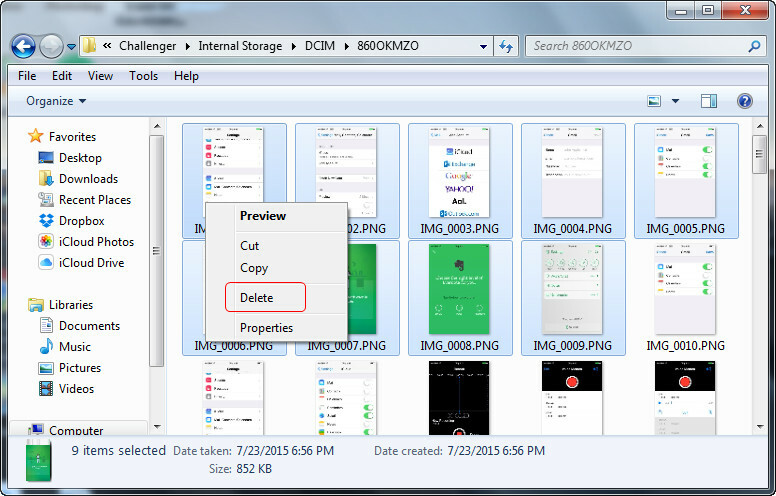 Leawo iTransfer will start deleting photos from iPhone in batch immediately. 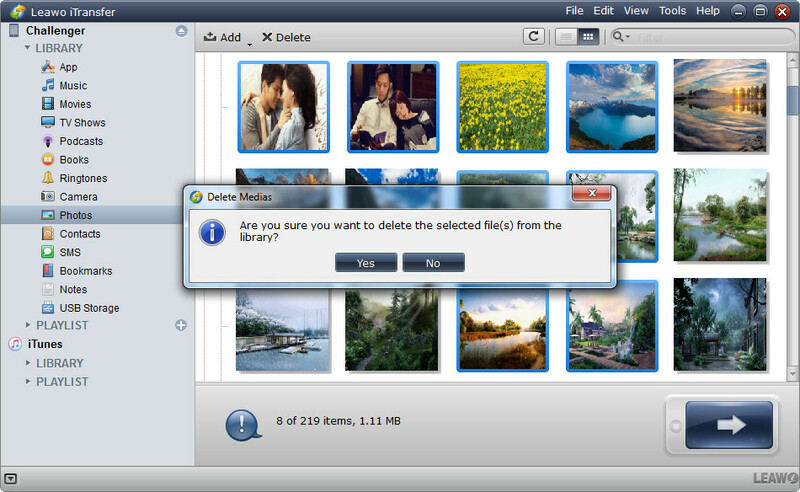 When the process is done, you will delete the photos synced from your computer. Leawo iTransfer is also helpful for other kinds of data transfers, for example, you can transfer music from iPhone to computer with this software. All the methods mentioned above will help you remove photos from iPhone, if you are in need, don’t hesitate to check them out.